On most newer RVs, the manufacturer includes a fold-out awning. The awning is attached to the door-side of the RV and is often about 75% of the length of the RV. The newer models are of a roll-out/roll-in design and have legs that can remain attached to the side of the RV or unfastened and placed on the ground. Another type of awning used by RVers is a portable pop-up canopy or tent (like an E-Z UP) that provides a temporary solution to people who want to be outdoors and enjoy shade. The frame usually incorporates an accordion style truss which folds up compactly. Some of these awnings have side curtains that can keep out wind and bugs. Wastewater from the RV toilet. Body waste. Called blackwater because if left in the blackwater tank long enough, turns black. A pipe built into the black water holding tank that is connected to a source of pressurized water via a hose that is used to help flush solids from the holding tank at a dump site. If using a black water tank flush system in a campsite, the use of a back-flow preventer on the end of the hose to prevent sewage from flowing into the potable water system is recommended. A variety of commercially produced chemicals that are added to the blackwater and graywater tanks to control odors. These chemicals may or may not kill the bacteria in the tanks and may or may not have an adverse effect on septic systems. Some wastewater tank chemicals contain enzymes that are supposed to control odors and help breakdown the organic materials in the wastewater. Commonly referred to as ‘blue’ or ‘green’, the latter being designed to be less harmful to the environment. The RV’S water supply when “Dry Camping” or on the road. An electrical device that is usually supplied built-in the RV by the manufacturer. The converter takes AC power from a campground electrical hookup (shore power) or generator and converts that power to 12 volts DC for use in the vehicle. Converters also charge the house batteries. A place where RV waste-water tanks are emptied. Usually a small concrete pad with a 3 to 4-inch brass fitting embedded into the concrete. The fitting accepts a sewer hose from the RV. Sewage dumped into the station goes into a sewer or a septic system. The brass fitting usually has a pivoting cover to keep rocks and other objects out of the dump station piping. Dump stations are usually situated so that an RV can be driven next to the receptacle. Dump stations often have running water for rinsing the RV’s sanitary pipes and for cleaning up the dump station pad. This water should not be used to fill an RV’s potable water tank. 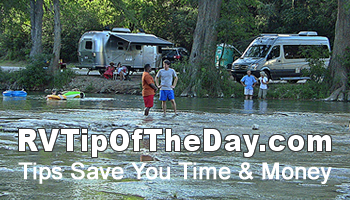 RV etiquette demands that when using an RV dump station, you clean up any spills. The act of emptying the waste tanks. On travel trailers and fifth-wheel trailers, usually over a certain weight, a supplemental system of stopping the rig is needed. Within the towing vehicle’s cab is a trailer brake device that uses the towing vehicle’s 12 volt DC current to apply a current to electrically-operated wheel brakes on the trailer’s wheels. The braking device senses the slowing momentum of the vehicle, usually with a small pendulum, to send a current to the trailer wheel brake actuators to help stop the rig. The current sent to the actuators is porportional to the rate of slowing of the vehicle. 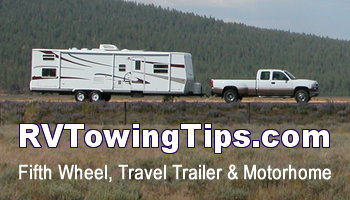 The fifth wheel coupling or hitch provides the link between a fifth-wheel trailer and the towing truck. Newer fifth-wheel hitches are pivoted in two dimensions to ease hitching up and to give the truck and trailer more freedom of movement together. Some models are called sliding-fifth-wheel hitches because the entire hitch assembly can be rolled from its forward towing position to a more rearward position for backing up and maneuvering in tight situations. This allows the driver of a fifth-wheel trailer more leeway in making sharp turns and not having the front of the trailer impact the cab of the truck. A gasoline, diesel or propane-powered device for generating 120 or 240 volts AC electrical power for use when boondocking or dry camping. Generators are rated by their electrical output, usually in watts. 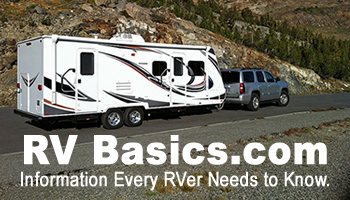 A minimum generator size for a small RV would be 1500 to 2000 watts. To run an RV air conditioner, a minimum of 3000 watts is usually needed. Larger RV’s with multiple air conditioners require generators with 6000 and more watts of capacity. Generators also charge the house battery(s). Generators are common in North America but very unusual in Europe, where their noise would be an unpopular intrusion to the rural calm of a campsite. Waste water from the sinks and showers. It is not truly “clean”, but it is not as “dirty” as “blackwater”. It is called graywater because it looks gray from detergents in the water. The batteries, usually 12 volt DC, that are installed on or within an RV. Known in the UK as ‘leisure batteries’. Usually there are multiple batteries combined in a parallel circuit which keep 12 volts but increase the amperes, but there may be a single house battery on some smaller RV’s. The house battery(s) are separate and isolated electrically from the vehicle battery(s) that are used to start and operate the motor vehicle part of the RV (motor of a motorhome, car or truck for tow vehicles or campers). RV batteries differ from car or truck batteries in that they are ‘deep cycle’ batteries. This means that RV batteries can be drawn down further before recharging than car or truck batteries. For best RV battery life, do not draw down the charge below 50% before recharging. Deep cycle batteries that are well maintained and cared for can last 10+ years. 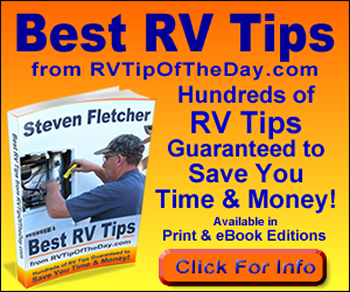 RV batteries that are poorly maintained and abused will last only a year or two. Batteries are rated in amp-hours; multiplying this figure by the battery voltage yields watt-hours, which indicates the length of time a known load can be run. An inverter takes the 12 volt DC house power from the house battery(s) and inverts that to AC power at the standard household voltage and frequency for one’s country. Inverters are not usually supplied in RV’s by the manufacturer. Inverters are rated by the output, in watts. There are two categories of inverters. The least expensive are called ‘modified sine-wave’ or ‘quasi-sine wave’ inverters. The more expensive versions are ‘sine-wave’ or ‘full sine-wave’ inverters. The modified- or quasi-sine wave inverters work well for most RV uses, but most inverter manufacturers recommend the use of full sine wave inverters to power televisions, VCR players and recorders, DVD players, computers, printers, fax machines and other electronic devices. Like a generator, inverters must be sized to accommodate the anticipated electrical load. Most inverters in RVs are rated at 1500-2000 watts. This is enough power to run a microwave oven or run a TV, DVD and computer but not at the same time as the microwave. The number of watt-hours that can be provided; how long a given load can be run; depends on the battery, after allowing for the slight inefficiency of the inverter. Heavy electrical loads like air conditioners, space heaters, water heaters and refrigerator/freezers cannot be powered by an inverter as the house battery(s) do not have enough watt-hours and would be run down quickly. A king-pin support is used on a fifth-wheel trailer to give the front of the trailer more stability. It is usually a tripod that attaches to the king-pin of the fifth-wheel trailer hitch. Most are adjustable with a hand crank. On a fifth-wheel trailer these are two jacks that are usually coupled together and are motor driven that lift the front of the fifth-wheel trailer up so that the truck can be driven under the front and hitch-up. Once hitched up, the landing gear jacks are raised to their stowed position for traveling. Installed under the RV, help to get the vehicle level once it has a place to stay. Many newer class A motorhomes and some fifthwheel trailers have computer-controlled leveling jacks that at the touch of a button, automatically extend and level the RV. On trailers, the manufacturer often installs rear leveling jacks that are either lowered by hand crank or a motor to give the rear of the trailer more stability. Low voltage refers to electricity from the house battery(s), typically 12 volts DC. This electricity is used to run lights, the water pump, the control portion of a refrigerator, the igniters for cooktops, smoke and gas detectors, fans, jack and slide-out motors and often the blower and control circuits of a built-in propane furnace. Refers to water to which ‘pink’ antifreeze has been added. This is done in cold climates to keep the internal plumbing pipes and tubing from freezing. Pink is used to imply that it is not toxic. Normal antifreeze is colored green or blue to show that it is a toxic chemical. Most RV refrigerators are “Absorption Cycle”, rather than “Compressor Cycle” appliances. These operate by the direct application of heat to the refrigerant, without the use of a pump, unlike most domestic refrigerators. In recent years special 12VDC operated compressor type refrigerators have been developed and are being used in some RVs. The typical RV (absorption) refrigerator uses either propane or electricity as a heat source. Most operate on propane or AC (2-way), while some add 12VDC (three-way). Three-way (powered) RV refrigerators draw too many amps to be powered by the house battery(s), but may run on 12VDC power while the vehicle engine is running, a generator is running or the RV is connected to shore power. Newer models use 12VDC to control electronics that switch power sources automatically. Absorption refrigerators are very sensitive to being level and do not function unless reasonably level. However, newer RV refrigerators are less sensitive to being run out of level. Anyone planning a long ferry ride with an RV should bear in mind that it is impossible to run the fridge while on board, where gas bottles must be turned off, and electricity is seldom provided. Is a method of showering that conserves water, wastewater tankage and battery power in a motorhome, trailer or camper while dry camping. The total time for the water being on is typically under 2 minutes and often less. The RV shower is similar to a Navy shower. Owners of smaller vehicles seldom use the shower in the van, preferring to use the campground showers. in Europe, black water is usually collected in a portable toilet with a detachable tank which is carried to the sanitary station. Sometimes referred to as a Thetford, Porta Potti or an Elsan (from commercial names), this tank has a small amount of ‘blue’ or ‘green’ added to it each time it is emptied, to manage odours. The sign for a sanitary station usually includes the word ‘Chemical’ in one form or another. Electricity that is available to an RV from a power company. The basic service in USA campgrounds is a standard 2-prong w/ground 120 volt AC outlet with 15-20 amps. Most newer USA campgrounds with electrical hookups offer three outlets in the connection box: 2-prong w/ground 120 volt AC 20 amp; 3-prong RV 120 volt AC 30 amp; and a 4-prong RV 120/240 volt AC 50 amp (which can power 120 volt loads and the large 240 volt loads at the same time). A variety of plug converters are available from RV supply houses to convert from one type of plug to another. (High voltage can kill when wired wrong, and the fact that appliances work does not mean that it’s wired right.) In the UK and most of Europe, 240 volt power is supplied through a 16 amp socket which is designed for outdoor use. In continental Europe, although the socket is rated at 16 amps, the circuit is often limited to a much lower current, sometimes as low as 3 Amps. Less modern campgrounds may use domestic sockets similar to those found in homes. A section of the RV that can be expanded by pulling it outward from the side of the vehicle, thus making the interior space wider. Many modern North American RVs feature at least one slide-out section – this is typically to widen the kitchen and better accommodate the seating area. Newer and larger motorhomes and larger fifth-wheel trailers (over 30′) often have three slide-outs: one in the kitchen, one in the living room and one in the bedroom. Solar panels or photovoltaic cells can be installed on the roof of the RV. They produce slightly in excess of 12 Volts DC (12.8 to 13). The panel(s) are used to charge the house battery(s) when the RV is not hooked up to shore power or the vehicle’s engine is not working or a generator is not present. Photovoltaic cells used on RVs are often 24″ x 36″ and produce 100 to 120 watts. The car or truck that is used to tow an RV trailer. A car or other vehicle that is towed behind motorhomes for use when the motorhome is set up in a campground and connected to utilities. Also called a “dinghy”. Fairly common in the US and Canada, but unheard-of in Europe. The electrical cord that connects the RV trailer to the towing vehicle (car, van, SUV, or truck). This cord brings electricity from the vehicle’s alternater to charge the trailer house battery(s). The umbilical cord also brings electrical current from the vehicle to control the electric brakes, stop and turn lights and night running lights on the trailer. This is the fresh water directly taken from a clean-water source. It may or may not be potable water, i.e., drinking water. used in the UK to refer to camping at unofficial sites or at the side of the road. The legality of this varies from country to country in Europe, and it can be risky in some places. The maintenance of an RV’s water system to protect it from damage during cold winter storage. This involves making sure all water is removed from the hoses and tanks using compressed air or adding a non-toxic antifreeze to the system. Some modern RVs are equipped with automatic winterization systems. This List is available under the terms of the GNU Free Documentation License.